The demo's are recorded at The Record Plant, Los Angeles. The Fergie Frederikson rehearsals are taped at S.I.R. studios, Los Angeles. � The Warrior story starts in 1982 with the Boston based band New England, featuring keyboard player Jimmy Waldo, bassist Gary Shea and drummer Hirsh Gardner, and how their plans to record their fourth album with Todd Rundgren were scuppered when their guitarist, John Fannon, unexpectedly quit the group. � They put the word out that they required a new singer, and as they shared management with KISS, Gene Simmons recommended an unknown Vinnie Cusano, who was then helping KISS with their �Creatures Of The Night� opus. Although KISS liked Vinnie Cusano, it was felt that his lack of height was a hindrance to joining them as a full-time replacement for Ace Frehley! � Vinnie sent New England a tape of his songs, and an audition was set-up. New England liked what they heard on Vinnie�s cassette so much that they decided to learn the whole set of songs in preparation for Cusano�s audition. The four hit it off, but it was obvious that this was a new band, soon to be christened Warrior, and not just a seamless continuation of New England. It was also agreed that the four would relocate from Massachusetts to Los Angeles, and began recording the songs that had appeared on Vinnie�s demo tape. � Fergie Frederikson was brought in to allow Vinnie to concentrate more on guitar. 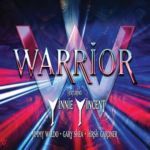 Despite making some very good music, Warrior�s career came to an abrupt end before it had even started when Vinnie was offered the opportunity to join KISS full-time, and become Vinnie Vincent, before eventually forming Vinnie Vincent�s Invasion. � Hirsh Gardner returned to Boston to produce, whereas Jimmy Waldo and Gary Shea would stay in Los Angeles, forming Alcatrazz with former Rainbow and MSG vocalist Graham Bonnet and a relatively unknown 20 year old guitarist from Sweden called Yngwie Malmsteen. � What we have here is a �what might have been� mini-album of previously unheard, original, classic hard rock by four respected musicians at the top of their game. As well as the original six studio tracks, we�ve been lucky enough to include five instrumental versions, plus a very rare rehearsal tape featuring the aforementioned Fergie Frederikson. Malcolm Dome�s informative and detailed liner notes help tell the story, with the input of band members Jimmy Waldo and Gary Shea. Track 04 : "Back On The Streets" is also recorded by the band 3 SPEED in 1984 for the "Voyage Of The Rock Aliens" soundtrack album. The same year Frehley's Comet demoed "Back On The Streets". Track 05 : "I Need Love", apart from being a Warrior demo, this song would be demoed, along with other Vinnie Vincent material during Vinnie's recording career with KISS. Parts of this song would be recycled into the Vinnie Vincent Invasion track "Shoot U Full Of Love". Track 06 : "Baby Oh Why" would be re-written as "Baby-O" for inclusion on Vinnie Vincent Invasion's 1986 album. For more details on these recordings check out MetalTalk.net, which page contains interviews with Hirsch Gardner, Jimmy Waldo and Gary Shea.